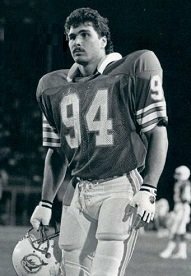 In the 1985 Citrus Bowl game, Larry Kolic intercepted two passes off Robbie Bosco of Brigham Young University to spark the Ohio State Buckeyes 10-7 upset victory over ninth rated BYU. On one of these, Kolic carried the ball 14 years into the end zone for the go ahead touchdown. For the effort put forth on these plays and the rest of the game, Kolic was chosen as the game’s Most Valuable Player. Kolic started his athletic career t Smithville High School, playing football and participating in track. He played both offense and defense on the football team and was a bruising rusher with 4.9 speeds in the 40 yard dash. In 1980, Kolic was chosen the Wayne County League’s Most Valuable Player and was also selected Class A first team All-Ohio. In track, Kolic set the state shot put record of 58’3 ¾” in 1980, but came back in 1981 and set a new record of 59’ 2”. In the same meet, against Canton Central Catholic, he threw the discus 149”10” to win that event and ran in the 440 yard relay to help his team win this event. At the State track meet he won the shot put event in both 1980 and 1981. The winning toss in 1981 was 62’3/4”, although he had practice throws over 64”. In 1981, when he graduated from Smithville, he was awarded a full ride four year scholarship to play football at Ohio State for Earl Bruce and his coaching staff. Personal problems kept him off the team some during his career at OSU, but he did play well enough to hold his own against teammates Byron Lee, Pepper Johnson, Eric Kumerow, and Chris Spielman (of Massillon). At one point, Bruce designed a new defense call the “Eagle” with a position for Kolic called the “nose backer”, which was a cross between a linebacker and a nose guard. The purpose was to occupy the center and one of the guards to allow the other linebackers freedom to get to the ball. Kolic was selected in the seventh round of the 1986 NFL draft by the Miami Dolphins. He will now be inducted into the Wayne County Sports Hall of Fame.